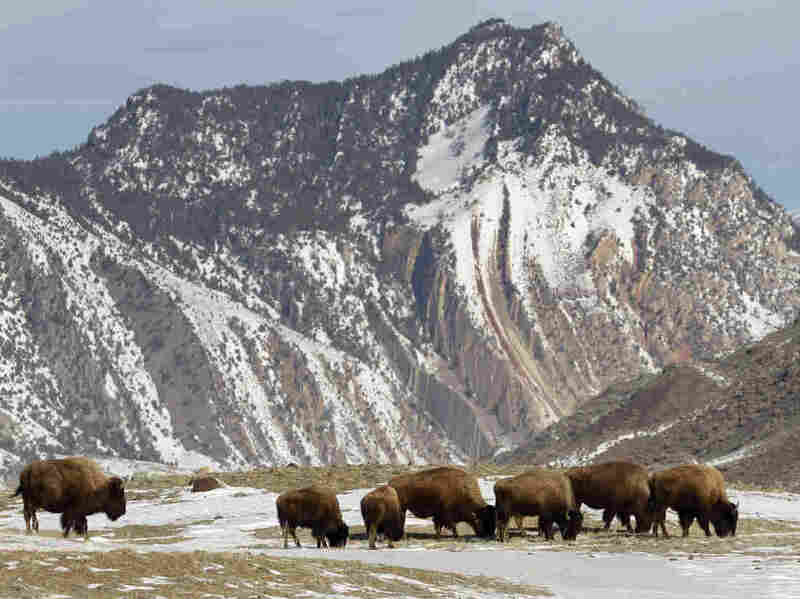 Search For Buried Treasure Linked To Illinois Man's Death At Yellowstone : The Two-Way Jeff Murphy is the fourth man to die while searching for a treasure chest reportedly buried somewhere in the Rockies by eccentric millionaire Forrest Fenn. An Illinois man was looking for buried treasure when he fell to his death at Yellowstone National Park last June. Here, bison graze just inside the park near Gardiner, Mont., in 2011. But he wasn't on just any hike. He was looking for a treasure box of gold and jewels worth up to $2 million, buried somewhere in the Rocky Mountains by an eccentric millionaire named Forrest Fenn. Fenn, an art dealer and millionaire in his 80s, lives in Santa Fe, N.M. In his self-published memoir, Fenn included a poem that supposedly leads to the treasure he hid in the mountains. "The ornate, Romanesque box is 10-by-10 inches and weighs about 40 pounds when loaded," NPR's John Burnett reported in 2016. "Fenn has only revealed that it is hidden in the Rocky Mountains, somewhere between Santa Fe and the Canadian border at an elevation above 5,000 feet. It's not in a mine, a graveyard or near a structure." Murphy is the fourth man to die while searching for the chest. While his death was reported at the time, it wasn't clear until NBC affiliate KULR obtained a copy of the park's investigation that Murphy was looking for Fenn's treasure when he died. "The report shows that Murphy emailed Forrest Fenn in the days before Murphy's death," KULR reports. "It also shows emails from Fenn to Yellowstone officials during the search. The man who invited people to look for his chest of gold and jewels in the Rockies was very concerned about Murphy, and also offered to help pay for a helicopter to find the missing man. He also wrote that he had never been to the area where Murphy fell." Linda Bilyeu, whose former husband died searching for the treasure in January 2016, told NBC News that the hunt was "ludicrous" and "should be stopped." After the death of 52-year-old Paris Wallace, also last June, Fenn posted additional clues to a treasure-seekers' blog, apparently with the hope of preventing people from searching in unnecessarily dangerous locations. He was about 80 when he hid the treasure, he reminded the seekers, and he had to make two trips from his vehicle.